Kings Of Metal MMXIV is a completely new recording with many surprises, celebrating the 25th anniversary of the release of Kings Of Metal and MANOWAR’s following world tour. Already a significant force with international success since their debut album Battle Hymns, the Kings Of Metal release in 1988 and the following world tour in 1989 catapulted MANOWAR into a new sphere. Songs like "Heart Of Steel", "Kings Of Metal", "Hail And Kill", and "Blood Of The Kings" became instant classics, celebrated since by metal fans all over the world. 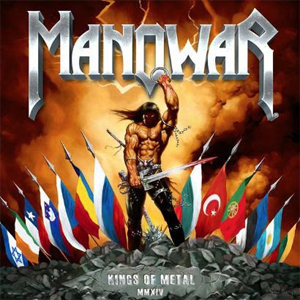 For Kings Of Metal MMXIV, MANOWAR have recorded these timeless metal anthems with new arrangements and their signature “larger than life” sound that sealed their place in heavy metal history. “Our fans have made us the ‘Kings Of Metal’, and with this tribute to one of their favorite albums, we honor them and thank them for their unparalleled support and loyalty!” said MANOWAR vocalist Eric Adams. Kings Of Metal MMXIV will feature nine main tracks packed with face-melting metal, plus nine bonus tracks with over 40 minutes of additional music. “We have pushed man and machine to the maximum level to honor the original recordings that we all love, and to add new aspects and surprises that give this new album its own character”, said MANOWAR bassist and producer Joey DeMaio. “The sound is again as massive and majestic as it has always been”, he continued. “Recording this album has been an amazing experience! After playing the songs so many times on tour, Donnie and I now had the opportunity to contribute our own sound and elements that the fans have come to love from our live performances,” explained guitarist Karl Logan. For the new narration on the spoken word track "The Warrior’s Prayer MMXIV", MANOWAR have joined forces with celebrated British actor Brian Blessed. Blessed is a renowned Shakespeare and character actor who has starred, among others, in Kenneth Brannagh's Henry V, Oliver Stone's Alexander, in King Lear, and as Prince Vultan in the cult movie Flash Gordon. For special effects of the highest level on "The Warrior’s Prayer MMXIV", sound effects specialist Hamilton Sterling was recruited; a Hollywood Veteran who has contributed to action blockbusters including Batman - The Dark Knight, Men In Black 3, War of the Worlds, and Master and Commander: The Far Side of the World, two of which won Oscars for Best Sound Editing. Kings Of Metal MMXIV will be released to retail on February 28th as a two-disc CD with two 24-page booklets and additional new art by legendary fantasy artist and longtime collaborator Ken Kelly, and as a digital double album. For the special anniversary, MANOWAR will also open their vaults and reveal never-before-seen photos and other insights into the history of MANOWAR and the Kings Of Metal era. "Sting Of The Bumblebee MMXIV"
"Blood Of The Kings MMXIV"